The appropriate gyroscope model for a given application is typically selected to satisfy a stabilising moment capacity at the natural period of the ship. The natural roll period represents the resonant roll period at which the ship roll is a maximum and is the typical period about which the gyroscope will most need to operate. Period matching is important as the useful torque output of a gyroscope is dependent on the period of its operation. The required moment capacity depends on the performance requirements of the installationand the severity of the intended operating environment. Typically a target may be expressed as roll attenuation in percentage reduction or absolute values in a prescribed sea condition. Established methods of sizing stabilisation system for operation underway, such as heel capacity (the angle to which the vessel can be rolled if the device is constantly applied at maximum capacity) can be applied for initial gyroscope selection. Whist a gyroscope cannot maintain a constant list angle, the use of such established methods and the moment amplitude provides a meaningful initial indicator of size requirements. If such measures indicate acceptable thresholds for stabilisation underway then extending this capacity to all speeds inclusive of at rest will provide a stabilisation capacity as a single source solution capable of all speeds. Rigorous analytic methods can be performed in accordance with requirements. Frequency domain analysis, as is widely used to analyse ship motion, can be readily extended to include the effect of a Gyro Marine Gyroscope. Here the roll response (and other axis responses) of the ship is determined at a range of discrete frequencies. The ship movement in a seaway is then represented by the cumulative effect of encounter with a range of waves of different headings and frequencies. As all Gyro Marine Gyroscopes are fully functionally tested on a state of the art test rig before delivery, the exact output characteristics of each machine, as a function of frequency, is accurately known. The frequency response of Gyro Marine’s active drive gyroscope can be integrated into the ship motion analysis to provide a performance prediction with and without the gyroscope. Performance simulation can include; visualisation of ship motion with and without gyroscope, relative reduction in roll motions at any speed, sea sickness probability; through to full operability analysis of vessel capability. Gyro Marine can propose an appropriately sized gyroscope for any task. Please consult Gyro Marine to discuss the specific needs of your project. All gyroscopes are tested at full scale on test rig for proper operation and output capacity prior to delivery. The test rig measures the actual stabilising moment by load cell measurement. 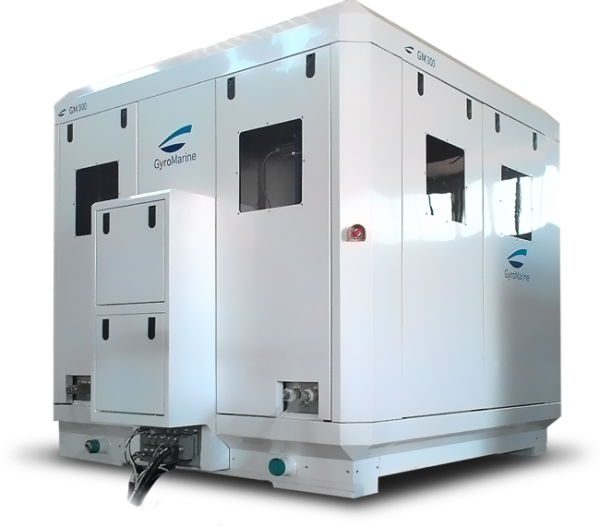 The gyroscope configuration, its operating condition and behavior are captured on test by direct connection of a data acquisition system to the standard control system. Once installed, the gyroscope can be used to demonstrate its own capacity by exciting the vessel to roll in calm water. It is hence possible to independently verify the gyroscope’s output capacity independent of the ship to which is applied. The ability to do the reverse of stabilisation and excite the ship to roll can be applied to perform a full-scale roll decay test of a ship to derive hull characteristics as built. A gyroscope’s capacity to stabilise is its angular momentum. This is a measure (Nms) of how big the rotor is and how fast the rotor is spinning. Gyromarine offers gyroscopes from 150,000 Nms to 1,500,000 Nms. Larger capacity can be met with multiple units. Each gyroscope model increment is approximately double the preceding model’s angular momentum. Intermediate capacities can be met by multiple units of different sizes. A single gyroscope of the appropriate size will always represent the lowest cost and the best weight and volume efficiency compared to multiple smaller gyroscopes. Multiple gyroscopes provide an additional level of redundancy. The moment or torque output of a given gyroscope depends on the precession rate, or how quickly the gyroscope moves in its gimbals and the useful orientation of that movement to roll. Rated Stabilising Moment is the maximum permissible load realised from the installed angular momentum in normal operation. Gyro Marine offers gyroscopes with stabilising capacities form 300,000 Nm to 1,850,000 Nm. Regulating the precession movement is critical to managing the loads to the ship. Too fast and there is risk of structural overload and too slow and there is insufficient stabilisation. Limiting the maximum permissible rate is the purpose of Active Braking. Ensuring that maximum permissible rate can be attained at all times is the purpose of Active Drive. Gyro Marine’s Active Precession Drive functions as both active brake and active drive. Why Gyromarine’s Active Precession Drive is Required in Larger Applications.